POLL: Which Love Team Had The Best Matching OOTD? Are you for #KathNiel, #JaDine, or #LizQuen? On-screen couples are often validated by their top-rating TV shows and blockbuster movie hits, and it's no secret that Kathryn Bernardo-Daniel Padilla (KathNiel), Nadine Lustre-James Reid (JaDine), and Liza Soberano-Enrique Gil (LizQuen) have all reigned supreme in that department. But what better way to show off their undeniable chemistry than with a matchy-matchy OOTD? Clearly, these three love teams got the memo! Remember when JaDine went to Paris? James and Nadine layered in style as they strolled around the City of Light. Both clad in all black, the real-life couple donned oversized coats, matching scarves, and combat boots. Also twinning in their all-black ensembles, Enrique and Liza made quite a fashion statement during their “workation” in the U.K. The on-screen couple went matchy-matchy in black jeans and bomber jackets, which they both finished off with spotless white kicks. Meanwhile, in Barcelona, Daniel and Kathryn were spotted with their own version of a couple OOTD. 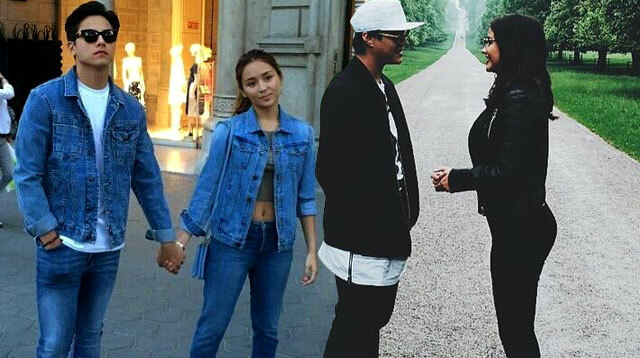 The Teen King and Queen walked hand-in-hand wearing medium-washed jeans and denim jackets. As much as we hate to break it to you, only one love team can reign supreme in this battle. Question is, which on-screen couple had the strongest twinning game?